Michelle has that voice that sounds like that actress...you know, the one that was on that show...remember? You’ll hear it on her demo. 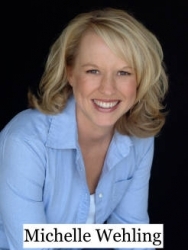 She’s voiced radio for Oklahoma Lottery Commission produced by Jordan Associates, Big Red Sports & Imports for Beals Cunningham, Edmond Medical Center for Stubble!Creative, and she’s appeared on camera for Tinker Federal Credit Union produced by 3rd Degree. Michelle is represented by Magna Talent.